Rewind to, oh, I don't know...probably about a year or so ago. At that time, there was absolutely no chance I would have tried this recipe. None. Nada. Zilch. No way in.....well, you get the idea. The reason, you ask? Mushrooms. I hated mushrooms. It wasn't necessarily the taste that I didn't like, because honestly, they don't have that strong of a taste at all. I always blamed it on the texture. But that wasn't really the problem either, if I'm going to be honest here. The truth is, I hadn't put a mushroom in my mouth for as long as I could remember. It wasn't until I was at a Japanese Steakhouse (you know, one of the ones with the super fun hibachi tables) when I decided to give the dreaded mushroom the good old 'Two Bite Club' try. Frankly, I felt a little silly picking through the mound of fried rice that was just put on my plate in hopes of trying separate out all of the little buggers. I put on my brave face and popped one into my mouth. Wouldn't you know it, I actually liked it! Imagine that! And to think, I had been ruling out so many delicious meals (like this one!) just because I thought I didn't like mushrooms. 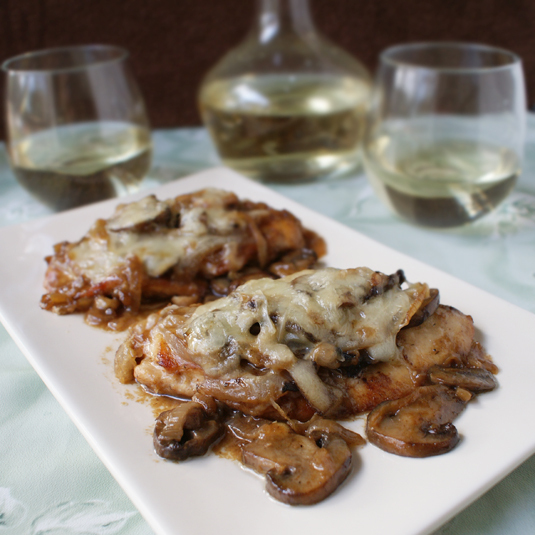 This recipe tastes so elegant, yet was so super easy to make. I got the thumbs up from my husband and, I'm happy to say, my daughter ate hers, too. I promise you won't be disappointed! 1. Preheat oven to 350°. 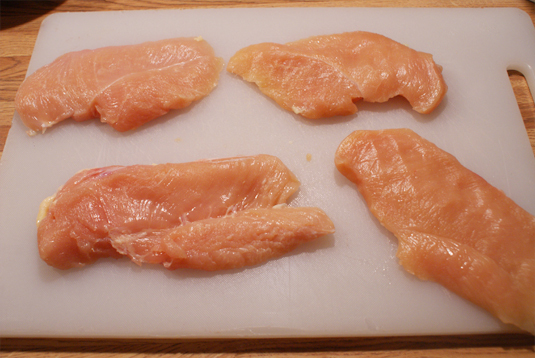 Slice chicken in half lengthwise to make four thin pieces of chicken. In a shallow dish, combine the flour, parsley and dill. 3. In a cast iron skillet (or stainless steel skillet) melt 3 tablespoons of butter over medium high heat. Make sure it's not too high or the butter will burn! 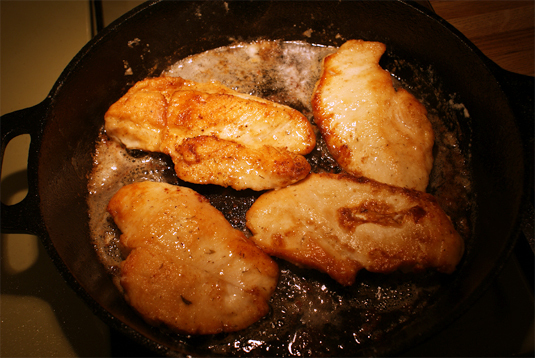 Dredge the chicken in the flour mixture and place into the skillet. Brown the chicken on both sides until nice and golden. 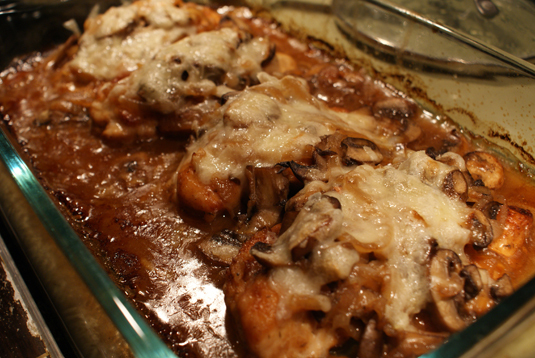 Remove the chicken from the skillet and place into a 9 x 13 glass baking dish. 5. 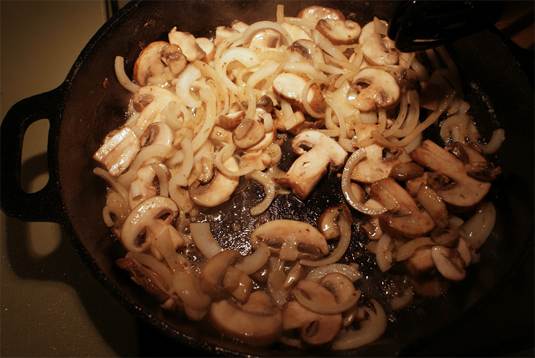 Melt the remaining 2 tbsp of butter in the same skillet and add the mushrooms and onions. Saute until soft and golden. 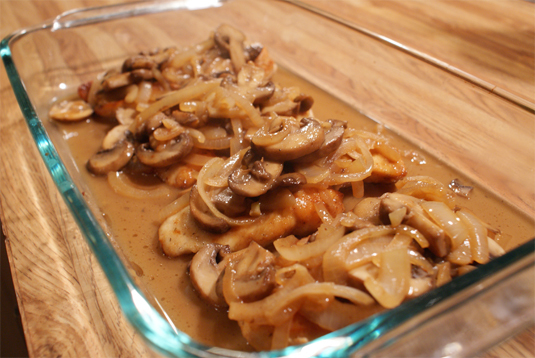 Add the wine to the onions and mushrooms and simmer for about three minutes or so. 6. 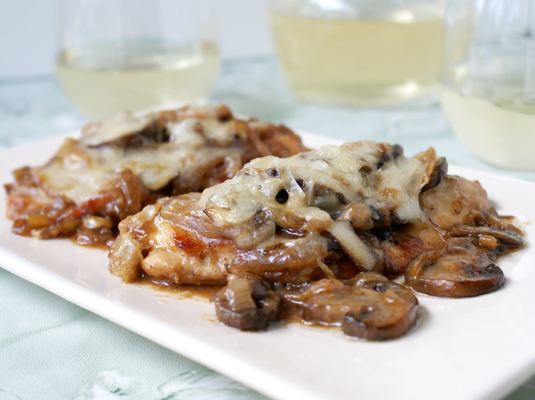 Top the chicken breasts with the onions and mushrooms and pour the remaining pan juices over the top of the chicken. Cover and bake in the preheated oven for 20 minutes. After the first 20 minutes of cooking time, remove from oven and top each piece of chicken with about a ½ ounce of the shredded cheese each and return to the oven an bake uncovered for 10 more minutes. 7. Indulge! 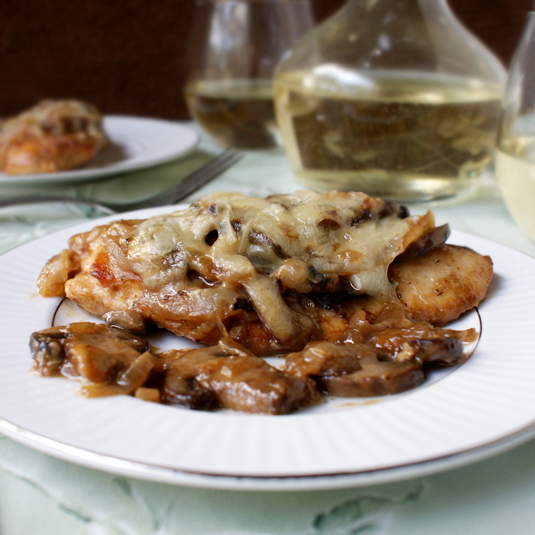 Simple, elegant and oh, so delicious! Source: Adapted from a recipe on allrecipes.com.